If you appreciate the common-sense notion of the Laffer Curve, you’re in for a treat. Today’s column will discuss the revelation that Francois Hollande’s class-warfare tax hikes have not raised nearly as much money as predicted. The French government faces a 14bn-euro black hole in its public finances after overestimating tax income for the last financial year. French President Francois Hollande has raised income tax, VAT and corporation tax since he was elected two years ago. The Court of Auditors said receipts from all three taxes amounted to an extra 16bn euros in 2013. That was a little more than half the government’s forecast of 30bn euros of extra tax income. And why have revenues been sluggish, generating barely half as much money as the politicians wanted? For the simple reason that Hollande and the other greedy politicians in France failed to properly anticipate that higher tax rates on work, saving, investment, and entrepreneurship would discourage productive behavior and thus lead to less taxable income. …economic growth has been inconsistent and the unemployment rate hit a record high of 11% at the end of 2013. The French economy saw zero growth in the first three months of 2014, compared with 0.2% growth three months earlier. The income tax threshold for France’s wealthiest citizens was raised to 75% last year, prompting some French citizens, including the actor Gerard Depardieu, to leave the country and seek citizenship elsewhere in Europe. But we do have some good news. A French politician is acknowledging the Laffer Curve! French Prime Minister Manuel Valls, who was appointed in March following the poor showing of Mr Hollande’s Socialists in municipal elections, appeared to criticise the president’s tax policy by saying that “too much tax kills tax”. By the way, France’s national auditor also admitted that tax hikes were no longer practical because of the Laffer Curve. Heck, taxes in France are so onerous that even the EU’s Economic Affairs Commissioner came to the conclusion that tax hikes were reducing taxable income. Though here’s the most surprising thing that’s ever been said about the Laffer Curve. …taxation may be so high as to defeat its object… given sufficient time to gather the fruits, a reduction of taxation will run a better chance than an increase of balancing the budget. And I bet you’ll never guess who wrote those words. For the answer, go to the 6:37 mark of the video embedded in this post. P.S. Just in case you’re not convinced by the aforementioned anecdotes, there is lots of empirical evidence for the Laffer Curve. P.P.S. For other examples of the Laffer Curve in France, click here and here. P.P.P.S. To read about taxpayers escaping France, click here and here. P.P.P.P.S. On a completely different subject, here’s the most persuasive political ad for 2014. I realize the ad doesn’t include much-needed promises by the candidate to rein in the burden of government, but I’m a bit biased. And in a very admirable way, so is Jack Kingston. P.S. Sorry, should have scrolled to read Ned’s comment. Would have spared me repeating the same thing. And only a small portion of the Laffer Curve has actually kicked in yet. Only a small proportions of the Depardieus who will eventually leave, have already left, a mere one year after the tax hike. People do not pack up and leave overnight, there is some inertia. Inertia politicians bank on when raising taxes and this is why revenue did increase after all, albeit by only half as predicted. The same inertia exists in people’s lifestyles, aspirations, ambitions, eg. on whether to pursue that PhD that will propel you into the 75% tax rate. People exhibit inertia and many await for more signals that the high taxation situation has become permanent before they make life trajectory changes. However, inertia bites both ways. Once people respond to flatter effort-reward curves by making more permanent choices towards the ever more indolent side of the spectrum, simple, or temporary tax cuts are unlikely to bring them back into a more ambitious and productive existence. It thus becomes ever more difficult to lower taxes against that inertia. Of course, when it comes to prosperity, tax revenue is just a red herring. The loss that dwarfs all other losses is not disappointment on tax revenue growth. It is foregone growth and prosperity. Yet, all the pitchforks got was 16 extra bn this year which is likely to decrease next year as more people realign their residence, productivity and lifetime ambitions to the flatter effort-reward environment. They French people also relinquished 563 extra billion of GDP, i.e. 563 billion in extra aggregate prosperity (and that is compounding only for 5 years to 2018). However unevenly distributed, it would have been much better than the near zero growth they have cornered themselves into. Americans, welcome to the club! In a few iterations of the [redistribution->lower growth->disappointment->return to the polls with even more pitchfork] cycle, you will start voting (and growing) like the French. When i read the subtitle of the BBC article, i smirked and didn’t bother to click to read the full article. Glad to see a full articulation of the thoughts that raced through my mind. Actually there is more than that in this post, but i’m glad all the same. While Hollande may have been surprised that individuals and companies have modified their behavior as a result of increased tax rates, he ain’t seen nothin’ yet. Most Laffer reductions in the tax base come with a significant time lag. 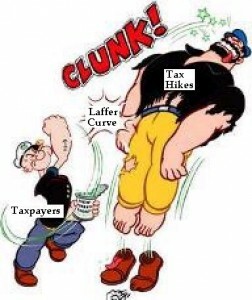 Inertia delays many adjustments to tax rate hikes until they actually start to bite. Investments that might have been made in a different tax climate are not made. However, the consequences to the tax base will not be felt for years. Investments not made compound, when future investments that might have built off earlier investments are also not made. Growth lost can never be recouped, since future growth must build upon a smaller base. Sounds like a little of your own Bulldog bias on Kingston vote against the gators!